The DUO eye lash glue is a high-quality, efficient, safe and cost-effective eyelash glue that will effortlessly meet all your requirements. If you want to use false eyelashes to complete your look for the weekend or that fun party, you will probably want to use professional and reliable eyelash glue. There are many different types available on the market, but there are only a few that really work well. DUO eyelash glue is the perfect product if you want to be absolutely sure that you not only have a safe, but also an efficient and high-quality eyelash glue that will continue to work throughout the day. Why opt for DUO eyelash glue? The eyelash glue of the DUO brand really needs no introduction. The best make-up artists have been using the eyelash product for years. The DUO eyelash glue is available in two varieties and offers you absolute certainty that your false eyelashes will remain in the right place throughout the day. It is also good to know that DUO eyelash glue is not only very efficient, but also very soft to the skin. This means you don't need to take into account any negative side effects. It is clear that if you trust the judgement of world’s best make-up artists and you are looking for a suitable eyelash glue, you are definitely recommended to use DUO eyelash glue! It is also possible to order DUO eyelash glue along with beautiful artificial eyelashes, for example the DUO Professional Eyelashes D12 Thin and Whispy. When you decide to order such a package you will not only receive beautiful, hand-made, high-quality artificial eyelashes, but you will also receive excellent eyelash glue that allow you to apply your false eyelashes safely. It goes without saying that purchasing such a combination is also interesting from a financial point of view. 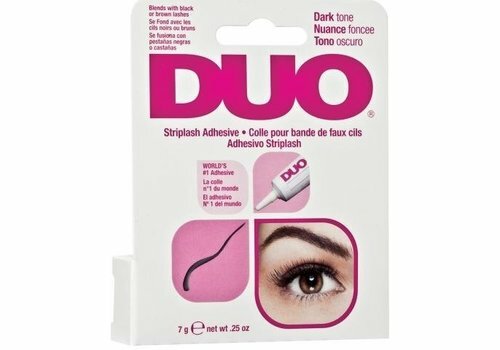 Purchasing DUO eyelash glue when you plan to apply false eyelashes is absolutely advisable; this is clear from the fact that DUO is one of world best sold brands of eyelash glue. When purchasing the eyelash glue of this brand, you not only have an eyelash glue that is characterised by an excellent quality, your false eyelashes remain perfectly in place and you don't have to worry about a high purchase price, on the contrary. If you also need an eyelash glue where you have the best price-quality ratio, you can rest assured that the DUO eyelash glue will meet all your expectations. Order your DUO eyelash glue here! When you are looking for a reliable, high-quality and cost-effective eyelash glue, you may have concluded that DUO eyelash glue will meet all your expectations effortlessly. When you are also interested in purchasing one of the DUO articles you will immediately notice that Boozyshop offers an extensive product range. If you are only interested in purchasing eyelash glue as you already have false eyelashes or if you wish to purchase them both in once for an even better price, it is certainly possible in the Boozyshop! 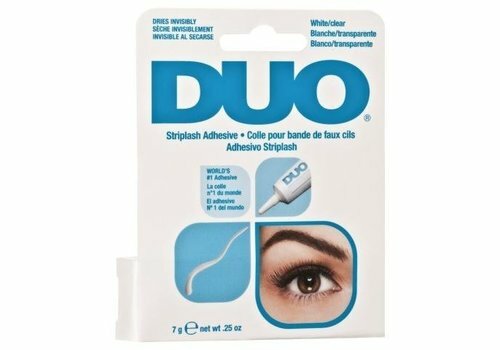 We have already provided some excellent reasons why it can be interesting to opt for purchasing your DUO eyelash glue at Boozyshop. But there is more. When you place an order via the internet you might experience very high delivery costs. That is annoying, as these delivery costs can cause your order to become more expensive; which is of course not the intention. Luckily there are other options. If you place an order with Boozyshop, you can rest assured that you pay competitive delivery costs. And if you order for 30 euros or more you get a gift with your order!